Gabbing Geek 29: South By Batsoup! 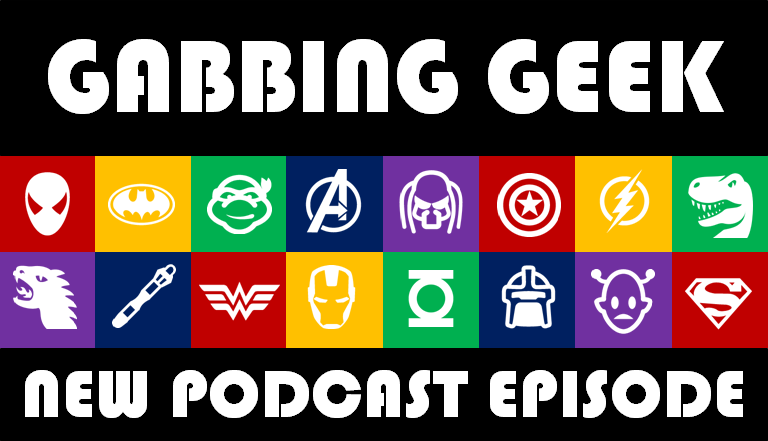 The latest episode of Gabbing Geek is so fresh you’ll want to slap it! Check it out now over at iTunes or wherever you get your podcasting goodness, or check out the web version to listen right now! More details after the break. All of Austin is abuzz with South By Southwest and Gabbing Geek is no difference as we present Episode 29: South By Batsoup. We start the show with three important announcements: that the Close Encounters re-watch has been moved to Episode 30 (we’re not pointing fingers except it’s all on Jenny), that the Ready Player One book club is still on for Episode 31, and that next week we’re going to try out the buzziest app from all of SXSW—Meerkat. Stay tuned to our website and Twitter (@gabbinggeeks) for more info on how you can watch us podcast live on Meerkat next week! We then turn to a fun new Watson game where Jenny and Ryan take turns trying to guess which fact applies to the five different men who have played Batman on the big screen. Then we turn to our latest List of Truth where we rank the 13 Superman and Batman films of the last 5 decades. Don’t forget to join us for our Geek Rematch of Close Encounters of the Third Kind for Episode 30 and our Ready Player One book club for Episode 31! And stay tuned to the website and Twitter feed for more details on our Meerkat broadcast! Be sure to check out our awesome new web site at http://gabbinggeek.com/ where we have tons of stories and articles about the geekiest content you want to read! Lip Sync Battle (And Anna Kendrick) Looks Amazing!